Norwegian Cruise Line introduces a first to Alaska. Back in 2001 Norwegian Cruise Line was the first to sail round trip to Alaska from Seattle. This made Alaska more accessible and affordable than ever before. This week (6/2/18) the new Norwegian Bliss sets sail to Alaska. This ship is truly a game changer for Alaska cruises. It is the largest cruise ship ever to sail to Alaska and has cruise industry firsts in activities, entertainment, dining and overall experience. The Bliss provides so many activities that guests are spread throughout the ship in different venues which makes the ship feel less crowded. Public spaces and lounges are larger here than on most cruise ships. The Observatory, for example, is probably one of the largest lounges at sea and is two-stories complete with 180 degrees of amazing Alaskan views. The lounge takes up one third of deck 15 and provides plenty of space to spread out. The ship is also one of the most environmentally friendly cruise ships ever built. Its exhaust cleaning system cleans 99% of sulfur dioxide emissions. The ship also has one of the best water conservation and recycling systems at sea. Go-Carts at Sea – The Norwegian Bliss is the first cruise ship to have a go-cart track. It is amazing to see how the track fits on the top deck aft part of the ship. It takes up two levels and has several fun curves and straight-a-ways. Dining – With 23 different dining options and a wide variety of bars and lounges, guests will have plenty of eating selections. The Bliss included a cruise line first BBQ smoke house called “Q”. The Bliss has all the standard restaurants previous guests are used to like Cagney Steak House, Le Bistro French cousin, La Cucina Italian and Teppanyaki Japanese Hibachi grill. It also has some fantastic new restaurants like Los Lobos, a Mexican-themed restaurant, and Ocean Blue Seafood restaurant. Many of the venues have outdoor dining on the waterfront (a Norwegian first introduced a few years ago). Family Fun – The Bliss has great activities for the whole family including the first laser tag area at sea, the Aquapark (an area with waterslides, splash areas and pools) and amazing kids centers. Entertainment – The Bliss offers top quality entertainment including Jersey Boys from Broadway, ¡HAVANA! – a celebration of music and culture from 1950’s Cuba, a comedy club, and a favorite of many Norwegian cruisers, The Cavern Club, which is based off the Liverpool club where the Beatles first performed and it even comes with a Beatles cover band! The Haven Suite Complex – This is a ship within a ship concept first introduced by Norwegian Cruise Line about 15 years ago. This is a keyed access area of suites where you can get a 5-star small ship luxury experience, but still have access to all the amenities and entertainment that a larger ship has to offer. While this isn’t a new concept for Norwegian, this certainly is the most luxurious complex they have ever built. The Bliss is truly a game changer for Alaska Cruising. It has more entertainment, activities, dining venues and amazing views than any other ship sailing to Alaska. 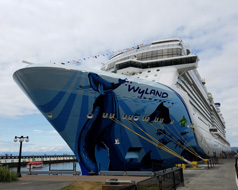 In fact, because of the success of the Norwegian Bliss, other cruise lines have announced they will start to bring their newer ships to Alaska in the next few summers. See Alaska in style on the new Norwegian Bliss!